The Lost Gospel of Judas Iscariot? Researchers say they have discovered the only known copy of the Gospel of Judas, which portrays Judas Iscariot not as a traitor, but as an essential player in helping Jesus carry out his mission. Alex Chadwick talks to Herb Krosney, author of The Lost Gospel. The Lost Gospel of Judas Iscariot? The final words on the last page of the codex read: Gospel of Judas. 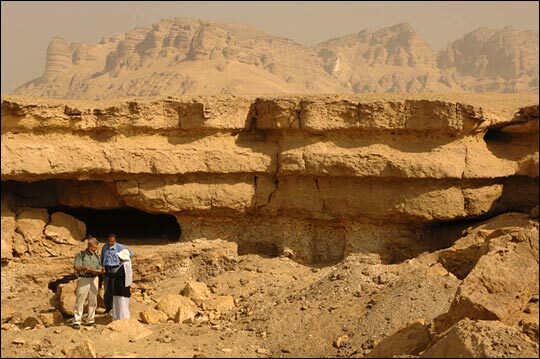 Caves in the area north and east of El Minya, Egypt, near where the manuscript containing the Gospel of Judas was found. Matthew, Mark, Luke, and John make up the four accepted Gospels of the Christian New Testament. Now a new gospel has been unveiled by the National Geographic Society -- one that focuses on the story of Judas Iscariot. To most Christians, Judas is seen as a traitor, the disciple who betrayed Jesus to the Romans for 30 pieces of silver. 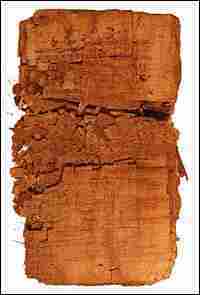 But a newly restored papyrus document dating to the 2nd century AD portrays a very different man. Judas is shown as Jesus' best friend, asked by Jesus himself to betray his identity to fulfill the prophecy and liberate his soul to ascend to heaven. The story of how this gospel was found, and the international effort to authenticate, conserve, and translate it, has been chronicled in the new book by Herb Krosney called The Lost Gospel. 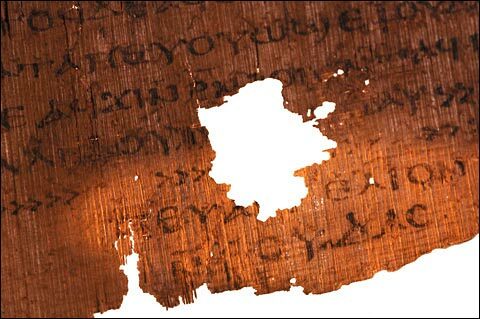 The leather-bound papyrus codex, believed to have been translated from the original ancient Greek to the Coptic language around 300 AD, was found in the 1970s in a cave in the desert near El Minya, Egypt. It then circulated among antiquities traders, moving from Egypt to Europe to the United States. The codex languished in a safe deposit box on Long Island, N.Y., for 16 years before being bought in 2000 by Zurich-based antiquities dealer Frieda Nussberger-Tchacos. When attempts to resell the manuscript fell through, Tchacos -- alarmed by the codex’s rapidly deteriorating state -- transferred it to the Maecenas Foundation for Ancient Art in Basel, Switzerland, in February 2001 for conservation and translation. Rodolphe Kasser, one of the world’s leading Coptic scholars, was recruited to reconstruct the manuscript and to transcribe and translate the text. The 66-page manuscript contains not only the Gospel of Judas but also a text titled James (also known as First Apocalypse of James), a letter of Peter to Philip and a fragment of a fourth text scholars for now are calling the Book of Allogenes. The National Geographic Society unveiled the only known copy of the Gospel of Judas on Thursday. The full story of the discovery and restoration of the Gospel of Judas can be seen on the National Geographic Channel. The first showing is Sunday, April 9, at 8 PM ET. Additionally, the Gospel of Judas is featured on the May cover of National Geographic magazine. Pages of the codex will be on display at the National Geographic Society, and will eventually reside at the Coptic Museum in Cairo, Egypt. 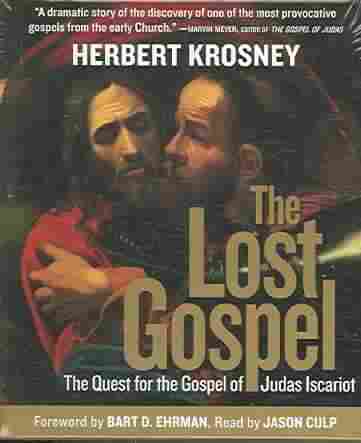 Question: Herb Krosney, what is in this lost gospel about Judas? 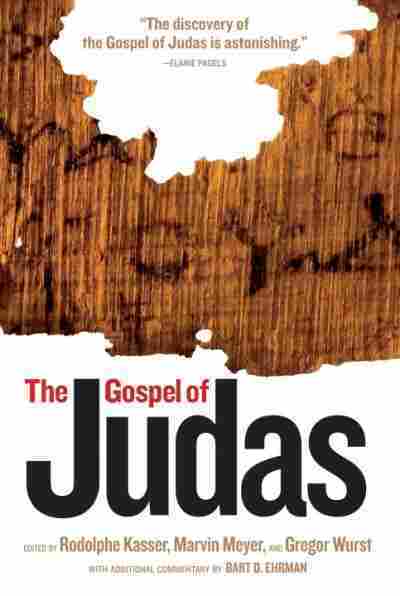 What does it say about Judas Iscariot? Answer: Judas is actually in a totally revised relationship to Jesus. He is Jesus' favorite disciple -- he is the person who enables Jesus to reach the heavens, and he himself is a star in the sky, according to the words of Jesus. Q: This is not the Judas Iscariot that we know from the Bible. In the Bible, Judas betrays Jesus, but this gospel tells a different story -- Judas' version of what happened. How is it different? What does he say? A: First of all, Judas and Jesus are meeting in some nether land possibly after the Resurrection. There's no direct mention of the Resurrection. Judas is a different kind of character. He's the person who is asked to make the ultimate sacrifice. And that sacrifice is to sacrifice the life of Jesus in order that Jesus may attain eternity and immortality. And Judas is the one who enables all of us to help find that inner spark within ourselves. I think that the gospel of Judas Iscariot is actually a very reverent document coming from approximately the 2nd century -- well after the four gospels accepted as the canonical gospels were actually written. We don't really know 100 percent that it's Judas' account. We know that a writer in the 2nd century told this story, which is the story of the encounter between Judas Iscariot and Jesus some time after the Resurrection. Judas is actually Jesus' best friend. Judas is the one who enables Jesus to fulfill his mission -- to die and to release that inner spark within himself and within all of us that is the divine. And that is the concept of this absolutely rare 2nd-century document, which is just coming to light. Q: Jesus in this account instructs Judas to betray him? A: Yes... and it's implied in some words in the actual canonical Testament -- but in here, it's quite explicit. Jesus is asking Judas to make the ultimate sacrifice -- to sacrifice himself -- and to enable Jesus to fulfill his mission on Earth. 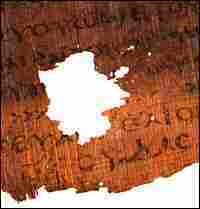 Q: This gospel is written on papyrus, this ancient Egyptian form of paper. It probably dates from about the year 300 (AD). How was it re-discovered? It lay hidden for about 1,700 years? A: First of all, we believe that it was buried in a burial cave in a place called Kararra, which is on the eastern side of the Nile. It was discovered by some peasants and it was sold to a dealer in Cairo and made the journey from Kararra... Then it began a really incredible 30-year journey which I've tried to trace through the world of antiquities dealers -- people not really knowing what it was, and all the time in a state of constant progressing deterioration. Q: People didn't know what it was, because it's written in this ancient Coptic language. And even though they knew that had a valuable ancient document, they didn't know how valuable. A: The first value assigned by the dealer was $3 million -- and $3 million in the early 1980s was an awful lot of money. It may seem a little bit less today, but not much less. It was an unheard-of sum among people who wanted to buy it, and there were people who wanted buy it up until 1983 and 1984. Q: But they were just buying an ancient document. They didn't know that this was the gospel of Judas? A: That is correct. They didn't know it was the gospel of Judas. It was not really identified as the gospel of Judas until the year 2000. Q: That's when a Swiss dealer actually bought it out of a bank vault out on Long Island, which is quite a long story of how it got there, but it lay there for about 16 years. She takes it to Yale and a scholar there says: "This is an unbelievable discovery. I can read this -- it says on the last page, 'This is the gospel of Judas.'" A: Actually, a scholar in 1983 in Geneva -- also a Yale PhD -- had looked at it, and he had seen the word Judas, but he didn't think it was Judas Iscariot, he thought it was another Judas, Judas Thomas. [That] would have more or less correlated with an earlier find called the Na Kamari, which had been discovered in Egypt in 1945. 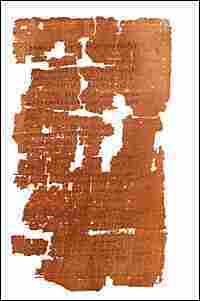 But this document was absolutely unique, and it is the only remaining testament that we know of a document that was originally written in the 2nd century. Q: And how do the scholars actually know this is authentic, was really written in the 2nd century? Because there's been so many forgeries, there's so much more to be made from these dealings and things -- how do we know? A: St. Irenaeus, who lived in the city that is now Lyon, France, wrote a condemnation of this particular document in the year 180 AD -- so we know that original document written in Greek was a valid document -- [that it] was in currency in the early Christian world. It was part of disputes that were flaming within early Christianity. Q: But there was such a thing as the gospel of Judas? Q: How are Biblical scholars going to regard this document? I mean, I guess that's going to be the subject for a while because these translations are new... But how is this going to change our understandings of early Christianity? A: I think that the gospel of Judas -- the lost gospel -- opens up quite a bit more of the history of the 2nd and 3rd centuries, where we really do not know a lot about early Christianity. Early Christianity was a very diverse movement. The split from Judaism was just occurring. There were remnants from Jewish messianism. We see it to some extent in the gospel of Judas -- we see a whole potential history beginning to unfold, one that we have not really been able to appreciate because the 2nd and 3rd centuries have remained in considerable obscurity over the years. Q: The gospel's been translated now, it's still in the process of conservation, most of it is kind of stabilized. What will happen to the gospel? Where's it going to go? A: The gospel first off will be made available for viewing by the public. There's going to be an exhibition that National Geographic is mounting which will also feature aspects of 2nd and 3rd century history and the whole history of how Christianity split from Judaism and evolved into a separate and distinct religion. At the end of the day, the Maecenas Foundation in Switzerland -- which is the owners of the document -- will be donating the document to the government of Egypt, which is where it was found, and will be housed eventually in the Coptic museum in Cairo. Q: Could you read something from the gospel? A: (reading) "The star that leads the way is your star, Jesus said to Judas... You will exceed all of them for you will have sacrificed the man that clothes me." A:What he means, as the scholars interpret it, is the soul of Jesus will be liberated from the body that entraps him. His soul is now liberated to come to heaven. Q: Herb, how do you know that this document that you have is authentic? A: There's been a process -- first of all, scientific dating, such as carbon dating, which has established the age of the papyrus. We've also at done tests [at National Geographic] on the ink [in which] it was written, and it corresponds with the ink that was [used] at the time. And various calligraphers and philologists that have looked at the document -- some who are among the greatest in the world -- have looked at this, and have no doubt as to its authenticity. Q: What did it look like when this Swiss woman finally got a hold of it? What kind of shape was it in? She opened these boxes and looked at it -- what did she see? A: Well, by the time that the Swiss lady who purchased it got to it, it was really a mess. It was practically indecipherable. The pages had been molded and blended together so that it was an incredible job of restoration to separate out the pages. There were numerous fragments that had been floating around, and all of this became a jigsaw puzzle that the experts this great restorer... had to solve. And they worked for five years now, since the middle of the year 2001 up to now, getting this document back to something we can read. Q: Herb, you're a writer, I know -- not a religious scholar. But can you foresee a time... when this gospel might be included in the New Testament? A: I would really doubt that it might be included in the New Testament. In early Christianity, there were at least 30 potential gospels floating around, and there were dozens and dozens if not hundreds of original documents which were winnowed down at an early stage in the 3rd and 4th centuries which became the New Testament and the basis of the new religion called Christianity. I don't think that any apocryphal document will now be accepted in the canon of orthodox Christianity. But what this document does is it opens us up into a whole world of history that we had not been able to fully appreciate before, and it gives a new and different interpretation of both Judas and his relationship to Jesus. A: Well, what was accepted as the canon of the New Testament was one thing, and there are many other documents floating around in early Christianity we can still read today [that] are documents of great interest, but are not accepted as divine revelation. And I think that probably -- almost undoubtedly -- the gospel of Judas, the lost gospel -- will fall into that second category.